Walter at the Cherry Blossom Picnic, from the series, Enter the Great Wide Open. © Aislinn Leggett. 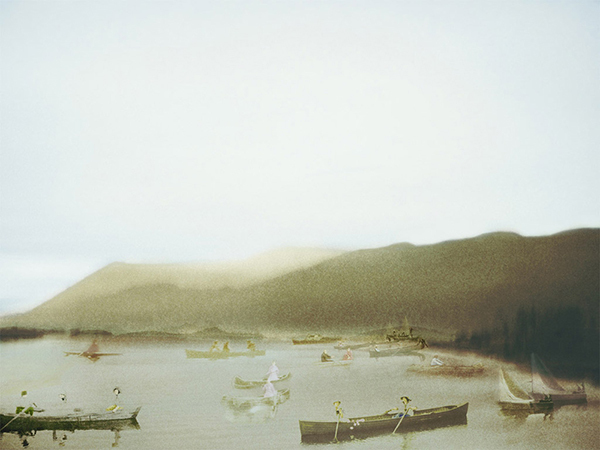 Quebec born artist Aislinn Leggett creates composite narratives of the Canadian landscape. 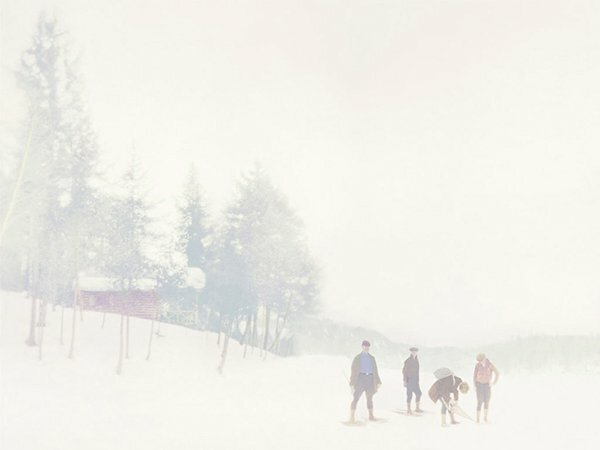 With a mixture of family photography and found images, Leggett crafts imagery that reverberates with the history of the Canadian landscape and its inhabitants. In this featured series, Enter The Great Wide Open, we follow a cast of characters and their special relationship to the land. Their ephemeral presence in these spaces casts allusions not to a memory carried by an individual, but by a lore passed through generations. Gregory Jones: First off Aislinn, tell us how you became interested in image-making, and who are some artists that you count among your influences. Aislinn Leggett: I think I’ve always been interested in images. I have a very vague memory of sitting on the floor at my great aunt and uncle’s watching a slide show from a recent trip they took. I must have been 4 or 5 years old, I don’t remember the actual photographs but I remember the light on the wall and sound of the projector. Maybe that was my precursor to image-making. I enrolled in a technical photography program in 2003 and was very much interested in street and documentary photography. My approach is much different now but I appreciate how I used to think about photography because it has subsequently shaped how I view and approach the medium today. For my influences, that’s pretty scattered. My work is very much influenced by memory and archives. I do pull from some of my own memories, but these days I’m doing quite a bit research on the theory of memory. My influences change from project to project, but if I were to pick artists to list here I would have to go with Gabriel Orozco and Michal Rovner. Mainly for the ways they approach art making. 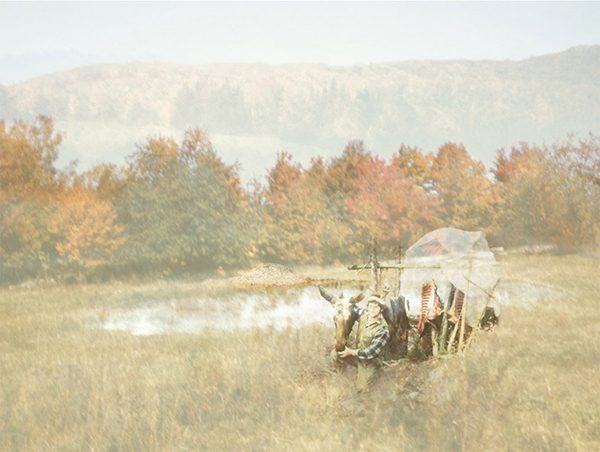 Theodore Hunting, from the series, Enter the Great Wide Open. © Aislinn Leggett. 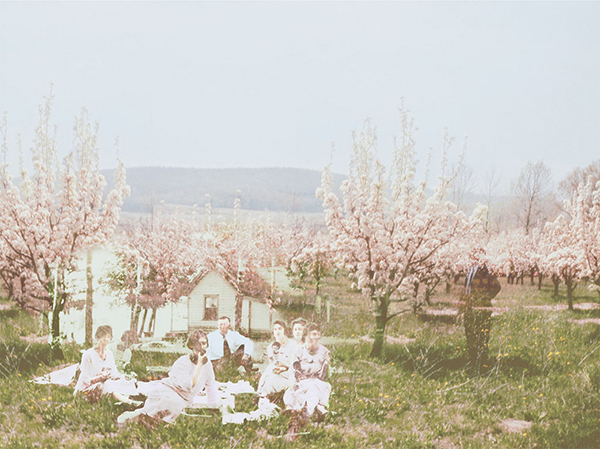 GJ: Your images are comprised of found photographs, both of landscape and vernacular family pictures. Please tell us a bit about your process, including how you decide on the images you use to build your own. AL: For Enter the Great Wide Open, the subject matter of the landscapes and people needed to revolve around Canadian iconography. So for the most part, I knew where my family archives were coming from but for the bought or found photos that wasn’t always the case. Obviously notes on the back of the photos are always helpful but that’s not always the case either, so my rule for those was that they needed to look typically Canadian. The photographs that I selected to work with were usually “bad photographs”, meaning that I liked it when they were under or overexposed, scratched or blurry. I did work with “good photographs” but they needed to become a little soft in the scanning process for them to fall into the style of imagery I liked working with. Eugene at the Campfire, from the series, Enter the Great Wide Open. © Aislinn Leggett. GJ: The quality of the light in these pieces is very distinctive. The way you build the light through your combinations of photographs is both soft and symphonic. 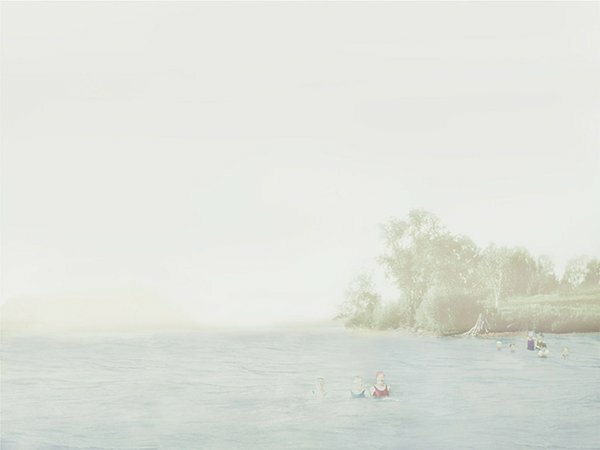 It also lends a painterly effect to some photographs, as in “Alice at the Lake”, which moves us as viewers further into a realm of fantasy rather than history. Are these meant to be read as works of fantasy or is it a more personal narrative you’re portraying? Or do you think it can go both ways? AL: I hope these images can be read in different ways. The approach was very much about history: the history of photography, the history of visual representation of landscape in Canada and also Canadian art history. I think it was inevitable for me not to ignore personal narratives but I think most often it was exaggerating family stories or events that I heard while growing up. There’s also the photographs themselves that naturally express narrative, so some of the inspiration was taken from the actual photos I was working with, again simply embellishing the story line. There was also the historical imagery that I pulled from to create my images, which were early watercolour paintings by Elizabeth Simcoe, who saw Canada for the first time in the 1790s. I was also interested in the history and background of The Group of Seven painters, which I pulled from their idyllic views of the country to help understand the foundation of iconic visual representations of Canada and the Canadian landscapes. And finally, there’s photographer Alexander Henderson who was a visual inspiration throughout the project. Henderson traveled extensively throughout the rural areas in Quebec in the late 1800s, photographing the landscape he traveled through along with newly settled land and the settlers themselves. He actually photographed very close to where I grew up, which to me, is pretty awesome because most of that land still hasn’t changed today. 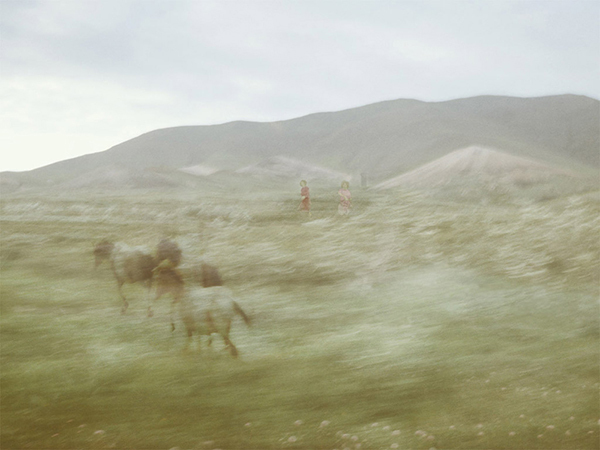 Margaret with the Horses, from the series, Enter the Great Wide Open. © Aislinn Leggett. GJ: Another very discrete characteristic of this work is the human subjects’ ghostly presence on the film. Most striking in “Walter at the Cherry Blossom Picnic” and “Margaret With The Horses”, they imbue the piece with an uncanny unreality, giving a sense that – no matter how innocuous it may seem- everything, everywhere, is actively haunted by its own past. What are you hoping the viewer will gather from their presence? AL: A photograph always depicts the past. So I think it fair to say that we often live in the past. Our normal photographs are usually clear and crisp, so we might not think about time passing or fading away but it is. And I’m not trying to be cynical! We talk about photos or show photos as if it represents the present (to a certain extent) but we are really capturing the past. By the time the photograph is captured, that moment is lost in time or maybe retained in memory for a little while but it’s the photo itself that becomes “proof” of that moment. At one point we will all become ghosts of our photographs. 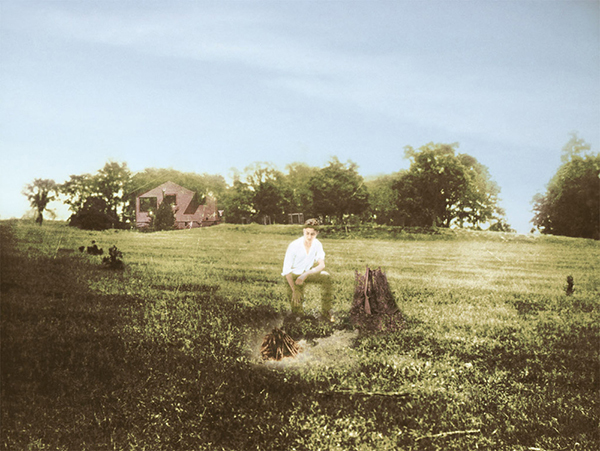 For Enter the Great Wide Open, the reason for ghosting the people had a lot to do with the subject of landscape again. The land retains the marks of time and of human alterations. Through a visual exploration, I wanted to try and show this along with the continual relationship between the body and the landscape. Gerry with His Fish, from the series, Enter the Great Wide Open. © Aislinn Leggett. GJ: This body of work shows us what could be a family or small society of people living off the land. They could be pioneers in some respects, or outcasts. The landscapes remain timeless, but we catch glimpses of a time-period though clothing styles (not to mention color and image quality, which would be left for a different discussion) This world seems like a place where nothing could go wrong. There’s a promise and a certain purity about these environments and the characters within; but at times it feels like they are temporary residents, and that they don’t quite belong. Do you have any thoughts on this reading? AL: Aren’t we all temporary residents? Everything changes and shifts and I think that’s why photography is so interesting, it’s use of a document and archival tool is really amazing. As for the period depicted in my images, it is another time and I wanted it to be. The photographs I use to create my pieces are from the 1920s-1940s. Some of the people might have been pioneers. Some had subsequently inherited land, farms or cottages from their ancestors, which allowed many to indulge and take advantage of the freedom of the outdoors. I believe there’s something comforting about being outside, in the forest, by a lake or in a field and the photographic archives that I have, I believe, echo that feeling. I envision my images to be little utopias. The environments being fictitious places and the people having been inserted into these landscapes, which consequently have been displaced from their original environments, is an attempt to somewhat create the perfect environment, the perfect moment or even create the perfect Canadian iconic visual references. Rose Swimming, from the series, Enter the Great Wide Open. © Aislinn Leggett. GJ: The style of the landscape photographs you use is flushed with the romance found in pre-modern landscape paintings; and the scenes you portray seem to represent lifestyles that are far removed from your viewers. I find there’s a strong contrast between the rustic and naturalistic imagery you use and the hard-to-discount digital methods used to craft them. There are many photographers whose work illustrates similar paradoxes as a result of digital manipulation; So the fundamental question, and this is one that this blog is centered around: Is your process something we should take into consideration when we discuss the ideas that your images communicate? AL: For the first part of the question – I don’t think the scenes are that far removed from today. I still know people that hunt, fish and completely indulge in the outdoors. We still photograph ourselves with friends and family out boating, canoeing, swimming, having picnics. 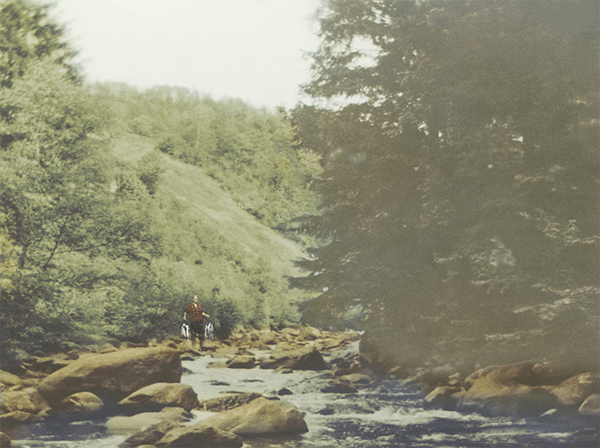 Style has changed, but the great outdoors as this utopic place has not. Again, we might approach it differently, but the idea of conquering the wilderness is still very much alive. The process I use is photo-composites and digitally painting the images. I think it’s inevitable for me to escape not talking about it. The process is part of the work and it could be discussed to a certain extent. Though once the concept of the process is understood, I would hope that the viewer could move forward to appreciate the work for what it is. Alexander at the Cottage, from the series, Enter the Great Wide Open. © Aislinn Leggett. GJ: Last but not least, what’s coming up for you over the next year, photographically or otherwise? AL: I’ll be continuing working with photo-composites, though I’m not sure if I’ll be continuing an Enter the Great Wide Open part 2 or creating a new photo-composite series. Right now I’m working on photo-composite portrait series, as well as a series of sculptural installations of deconstructed and unraveled clothing. Alice at the Lake, from the series, Enter the Great Wide Open. © Aislinn Leggett. Aislinn Leggett was born in Namur, Quebec, Canada. Working both with traditional photography and photo-composites, her work explores memory through objects and archives. Her work is influenced by the history and stories of her family, the history of art but more specifically with the history of photography and how the medium is used today. With her work, she explores not only what or how we remember, but the myriad of ways in which remembering happens. 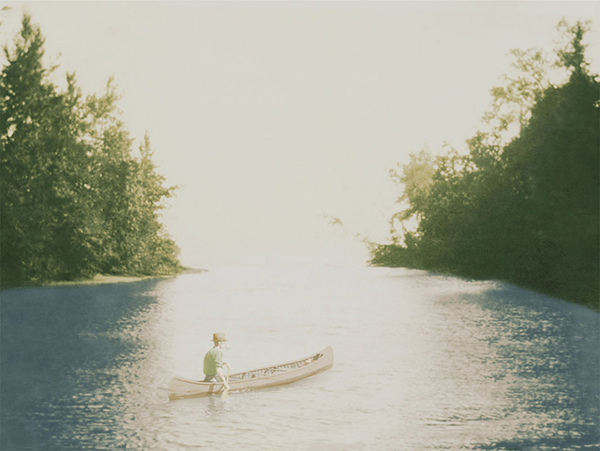 Thomas in the Canoe, from the series, Enter the Great Wide Open. © Aislinn Leggett.